New manufacturing technology utilizing a Face Hob Process which features a single-pass pinion tooth machining operation compared to a conventional three-pass process for machining. CNC cut and lapped gear teeth. 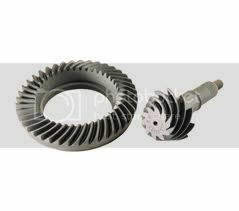 Higher strength and better quality gears are produced with the Face Hob Process. NOTE: These new gears look a little different, the gear teeth are cut on a different angle and the ring gear has a bevel on the back of the gear.